The first Capital of Norway. The city was founded by the Viking King Olav Tryggvason in AD 997, and occupies a special place in Norwegian culture and history. Trondheim was the nation's first capital, and continues to be the coronation city where Norway's kings from Harald Hårfagre (872–933) to King Harald V (1991 -) have been hailed, crowned and blessed. In its history the city was and is now again a popular destination for pilgrimages. 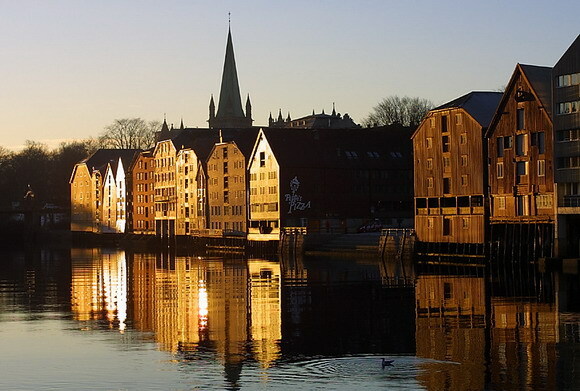 Trondheim is also an ecclesiastical centre, a regional capital, a center for industry and commerce, and an important education and research center. The river winding slowly around the city's downtown district and the old wharves along the mouth of the river. The wide streetsThe tall column with the statue of Olav Tryggvason the Viking king in the middle of the town square. The old town bridge ("Gamle Bybro") with its carved gates. The wooden houses in the downtown and Bakklandet districts. Ringve National Museum is the only Norwegian museum specializing in musical instruments from all over the world. The museum is situated at Ringve estate on the historical Lade peninsula. The estate dates back to the 1740s and is built in the style characteristic of the area. The Museum shop offers a great array of exciting musical gift items. While at the museum take a walk outside in picturesque Ringve Botanical Gardens which surround the museum, or visit "Tordenskiold Kro", a charming café where you can enjoy delicious waffles hot off the iron. We will have a demonstration of some of the old instruments from 1700 - 1800 century. We will also visit the Nidarosdomen - Norway`s largest cathedral.